As the overall Horse Journal favorite, voted product of the year three times, you can put your trust in Sore No-More® Classic Poultice. 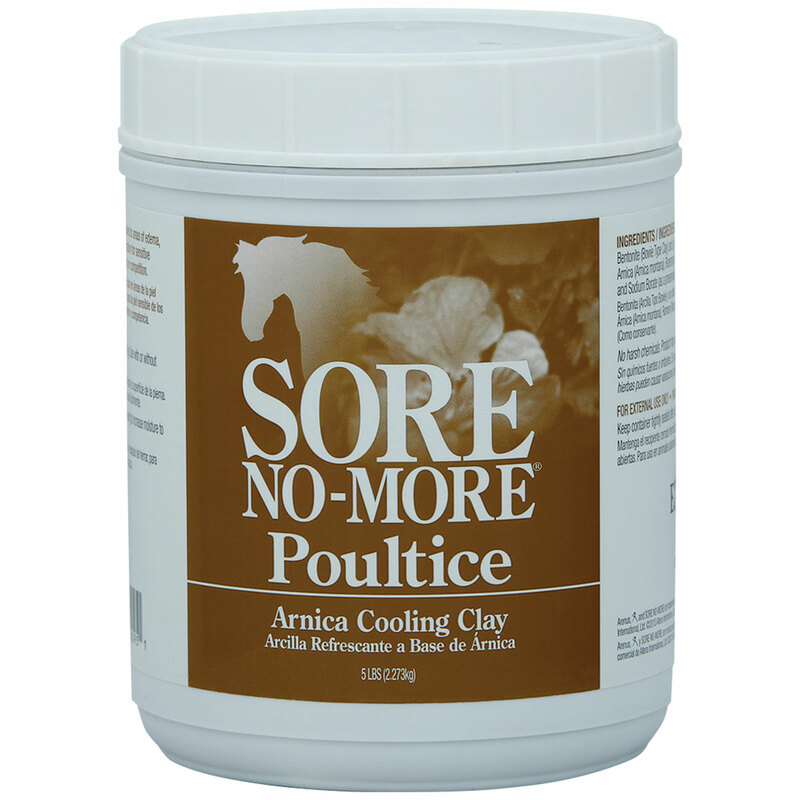 Sore No-More® Classic Poultice is great for use in addressing abscesses as the clay helps draw out toxins and bring pockets to the surface, reducing recovery time. Smooth onto ankles, cannon/metacarpal/metatarsal region, knees and hocks before and after exercise to help reduce inflammation and ease discomfort. •Once applied, this poultice can be left unattended, alone or under wraps. •Can be used with or without paper, plastic wrap or bandages. Sore No-More® Classic Poultice is rated 5.0 out of 5 by 4. Rated 5 out of 5 by Sarah from Excellent poultice! This product goes on smoothly and works wonders. Majorly reduced the pain and swelling on a tendon injury within four weeks (with massage and hydrotherapy and standing wrap treatments). Rated 5 out of 5 by IsaInDC from Awesome Easy to apply and easy to remove. Love that it contains sore no more "potion" and love the smell. Rated 5 out of 5 by deannamiller929 from Awesome product! I had bought this a couple weeks ago before my horse and I went to a show... I applied it to his legs because I noticed his legs were swollen from being in a stall when I had washed the poultice off after 4 hours, his legs were completely back to normal! This is the best poultice I have tried! Rated 5 out of 5 by pryan13 from Magical! My horse has an old suspensory ligament injury that became majorly enflamed this fall. My vet said that she would need to be iced and poulticed after any strenous exercise. At first, this seemed like a pain, but with this poultice, it is so much easier! This poultice glides on to my horse's cannon bone and spreads evenly so that it is easy to wrap. It is simple to remove once dry...I just get a wet curry mitt and brush it off. I most definitely reccomend this poultice to make the sometimes stressful process!